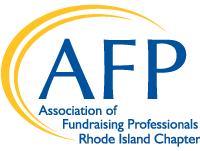 Established in 1987, the Rhode Island Chapter of the Association of Fundraising Professionals (AFP-RI) currently serves more than 130 members. AFP-RI is dedicated to advancing philanthropy by improving the skills of fundraising professionals, increasing the participation of members and nonmembers alike in Chapter activities, and expanding our professional and career opportunities to embrace the diversity of our communities. Awards – AFP-RI honors outstanding philanthropists at National Philanthropy Day and recognizes individuals celebrating milestone anniversaries as AFP members at our annual meeting. For more information on the Rhode Island Chapter, please contact Geri Manning at gmanning@stelizabethcommunity.org. To learn more about AFP membership categories click here. To visit the AFP International website click here.